Sorry I haven't posted for a week, but it's been all go. The book launch was on Wednesday night (day before yesterday) and it went better than I could have hoped. My daughters made gorgeous cup cakes and cookies, and Carrie (the illustrator)'s mum made punch and brought some other nibbles. The shop was so packed that we ran out of chairs and there were people standing at the back. Carrie's family came down en masse, my family were there, my housegroup from church were well represented, and there were friends from my writers circle and a few others. David, the lecturer who put Carrie and I together, came, and so did Colin from the Historical Association, Swansea. 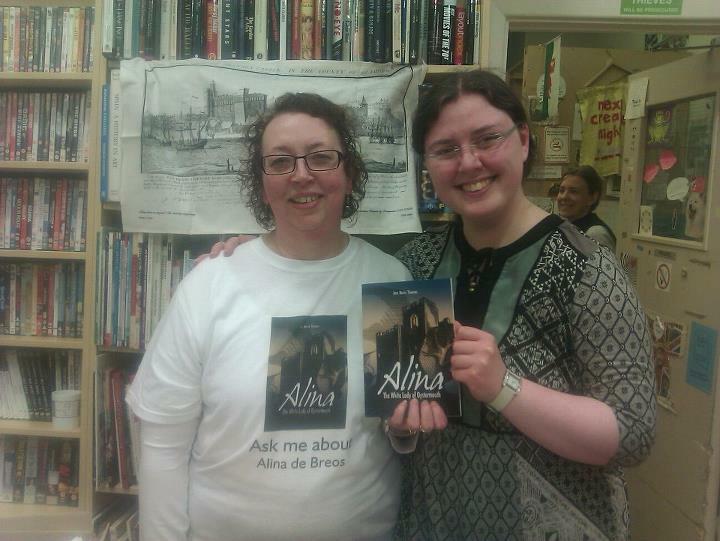 I was wearing my new T shirt with a picture of the book and 'Ask me about Alina de Breos' on the front and back, which went down well. I welcomed everyone and spoke about how I came to write the book and the beginning of the story, then Carrie spoke very well about the illustrations. Then it was everyone queueing to buy the book and have it signed by both of us, and Carrie sold lots of prints of the illustrations. She presented me with a print of the White Lady and we bought one of Queen Isabella on a horse, which seems to be quite a favourite. I had my photo taken by the Evening Post the day before, as the photographer wasn't free on the night, but I didn't see the reporter on the night, and it's not appeared in the paper yet. We're keeping watch.